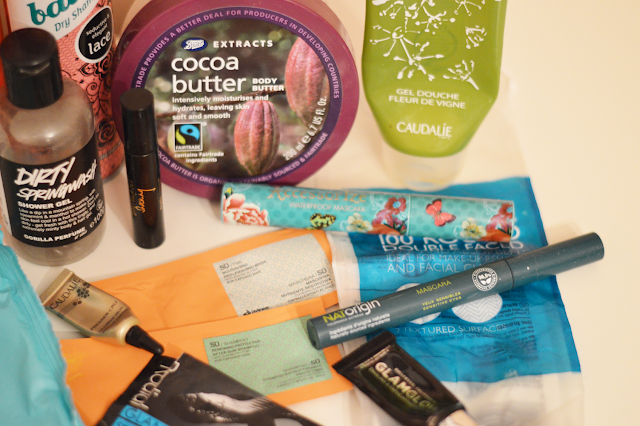 Beauty In The Mirror: Empties and lots of them! Empties and lots of them! 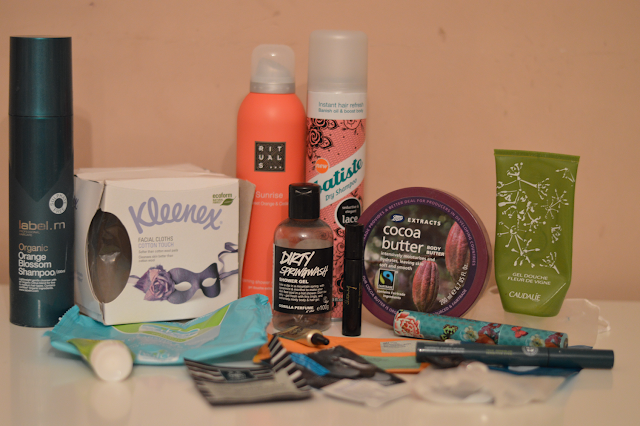 Right I just want to get one thing straight, these have accumulated since my last empties post which was my September empties. So please bare in mind these empties aren't all from one month, I may be quick but I'm not that quick! Right little intro over let's get down to business. Boots Extracts Cocoa Butter Body Butter a really good all round thick heavy duty body butter. Nicely scented and very moisturising, this is closest thing to The Body Shop body butters which I love. The cocoa butter used in this body butter is organic and sustainably sourced and fair trade. Repurchase? Yes but not for now because still have a mountain of body potions to use lol. 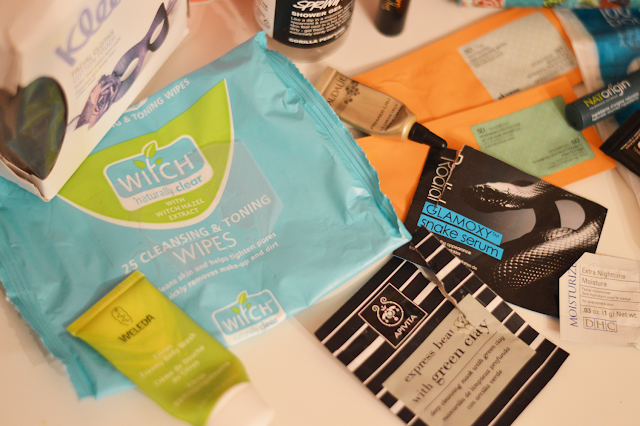 Witch 25 Cleasning & Toning Wipes are great for on the go or for days when you feel a little bit lazy. 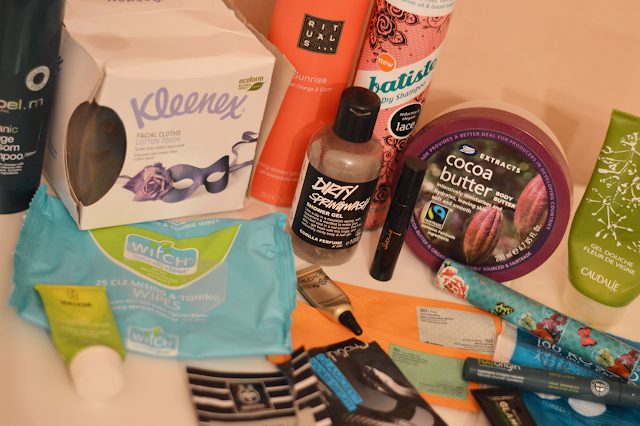 I'm not a lover of cleansing wipes but think they're a staple and always handy to have a pack in your stash. Repurchase? Possibly? Caudalie Fleur De Vigne Shower Gel. Now this was a disappointment, I like Caudalie as a brand and have tried a few products from them but have to say this is one of my least favourite. The scent wasn't anything special and to be honest there wasn't really any type of scent. I ended up giving the hubby permission to finish it off, lol! Repurchase? No. Rituals Foaming Shower gel / Sunrise. I've literally just written up a review about this so wont go into detail here but a winner and a definite repurchase but want to try a different scent. Davines SU Nourishing Mask is right up there with my top 3 favourite hair care masks! The smell alone makes it special. Repurchase? Possibly but would like to try a conditioner from the normal everyday range. Apivita express beauty with green clay is a great deep cleansing facial mask. Apivita is a Greek skincare brand which is now available from M&S which is great news for us UK folk! Repurchase? Yes- really keen to try other masks. Caudalie The Eye Cream. This was only a little 1ml sample but my heck did it last me! The skin around my eye area was hydrated and felt firm after using this. Repurchase? No- have a few eye creams to use up! Weleda Citrus Creamy Body Wash is a morning product for the shower without a doubt. Perfect for this time of year, the creamy formulation works well on the skin and the Citrus fragrance really comes through. Repurchase? No- have lots of body washes to use up still. YSL Shocking Mascara really impressed me, it's one of those products which you don't necessarily need but you want. This would be a treat for me to purchase.I liked the smell- is that weird in a mascara? The scent? I can't say I've ever paid much attention but when I first tried this one I noticed the scent and liked it. The brush is very special- repurchase? Yes please santa! NATOrigin Mascara was a happy surprise, this is actually a very good mascara for lengthening lashes. 98.5% made from natural organic ingredients and perfect for lens wearers. Repurchase? Possibly but not sure? GLAMGLOW Mud Mask is amazinggggg! Seriously I noticed a difference the day after. It does tingle and once it begins the drying process your skin does look rather peculiar but very benefical none the less. Repurchase? Not sure because of the price tag? Rodial GLAMOXY Snake Serum felt fabulous and made such a difference to my forehead lines. I just wish it was long term! Repurchase? No- BIG price tag. PHEW!! If you got through that- PAT ON THE BACK!